UK: The fight is on to save on of the most historic cinemas in London’s West End. “Leading heritage groups are making last-minute protests against plans to tear down one of Leicester Square’s oldest cinemas. The Art Deco Odeon West End opened in 1930, survived bombing in the Second World War, and now hosts the BFI London Film Festival.” Judging by the failure to save the likes of the Lumiere Cinema (now a Gymbox) it would sadly seem a lost cause. Link. UK: West London suburb Chiswick is getting a new art-house cinema. “A community cinema was given the green light last night (January 16) to move into the former Rambert Ballet School site in Chiswick High Road… Branding it as their toughest application yet, [Picturehouse Cinema]- which owns six venues across London and 15 others in the UK – can now move forward with their plans for a five-screen cinema with two bars, a cafe and a terrace.” Link. UK: Cinema Competition Madness, part I. “Work on a second cinema for Walsall town centre will start this summer after a new operator was secured for the multi-million pound development, it was announced today. Light Cinemas will run the screens at Walsall Waterfront, creating 30 jobs. It comes just weeks after it was confirmed a rival complex in the town will also open next year.” Odeon pulled out and Light Cinemas stepped in to compete with Vue. “Council leader Mike Bird said: “I have my doubts whether Walsall can support both but that is up to them to decide. It is showing that people want to invest in the town.” Link. UK: Cinema Competition Madness, part II. “Developer Prorsus has thanked the people of Trow-bridge for their continuing backing of plans for a £46m cinema complex on the former Bowyers factory site… The hearing, overseen by planning inspector David Nicholson, saw Prorsus fighting to overturn a Wiltshire Council decision – made in June 2012 – to reject plans for an eight-screen Cineworld, a Morrisons supermarket, six restaurants and a pub to be built on the derelict site.” The town already has a newly opened seven-screen Odeon cinema. Link. India: “BIG Cinemas continues with its expansion plans with carefully chosen revenue centers and launches yet another property in Ajmer, Rajasthan in association with Ansal A.P.I. The Big Cinemas Multiplex is located at the Ansal Courtyard Mall. The Big Cinemas, multiplex in Ajmer is Reliance MediaWorks 98th multiplex in India, and 7th in Rajasthan.” Link. USA: “A second, smaller movie screen will open Friday at the Sun-Ray Cinema in Riverside [Jacksonville, Florida]. That doubles the possibilities at the old theater, which has made a niche for itself by mixing up mainstream, independent and vintage movies, along with hosting frequent presentations from visiting filmmakers, comedians and even rock stars such as Richard Hell.” Link. USA: Connecticut, “The Zoning Commission will hold a second public hearing on the proposed Southbury Riverview Cinema and Playhouse project at 7:30 p.m. Wednesday at Pomperaug High School on Judd Road. Developers of the proposed eight-screen movie house, retail and restaurant project at 690 Main St. South spent three hours Wednesday night describing their plan to commissioners.” Link. China: As previously reported here in CJ (why China BO growth isn’t all good news for Hollywood), CelebrityCafe notes that PRC added 5,000 screens last year. “China now has over 4,582 cinema complexes and 18,195 screens. This has been an increase of 25 percent and 39 percent, respectively, Variety reported. These numbers include the recent opening of 903 new mega complexes.” Link. UK: More on how live event cinema and especially plays help revitalize regional cinema. “Aberdeen may enjoy a thriving theatre scene, but can sometimes be a bit frustrating waiting for the latest hit show to leave London behind to tour to UK. Perhaps that is why the Belmont Picturehouse has upped the ante with its live performances screened via satellite for 2014, releasing a list of new shows that are sure to tickle the tastebuds of the discerning theatre lover.” Although worth noting that contrary to what the article claims Made of Stone was a documentary, not a live event, and A Curious Incident will most likely be cancelled as the theatre where it played closed after the ceiling collapsed last month. Link. 3D: In the article ‘Glasses free 3D mooted for Avatar sequels’ the author makes some good points, but seems confused or muddles the issue about ‘glasses-free 3D’, particularly with regards to Dolby. “It could be that glasses-free 3D is just the shot in the arm that the movie industry needs, and with companies already experimenting with Dolby 3D glasses-free technology, it could be that ‘Avatar 2’ is the first big movie cinema goers can view in 3D without needing to wear glasses.” This is only ever likely to happen for television sets and not for cinema. Even James Cameron can’t ‘will’ glasses-free 3D cinema to happen. Link. 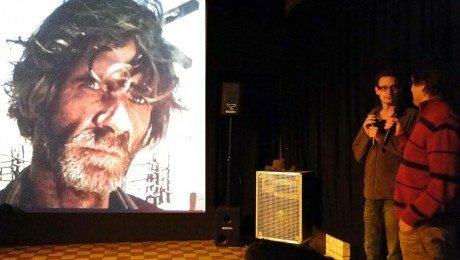 Cinema Karaoke: A Berlin cinema asks its audience to ask, ‘Are you talking to me?’. “Singen verboten! Im Filmrauschpalast in Moabit steigt Freitag der etwas andere Karaoke-Abend. Statt Lieder mitzuträllern, werden Film-Dialoge von Komödien bis Western mitgesprochen. So wird der Zuschauer zum Synchron-Sprecher. Sprich mir das Lied vom Tod! Und so geht’s: Aus über 90 Szenen von rund 40 Filmen können die Kino-Gänger kurze Sequenzen (maximal zwei Minuten) auswählen. Die werden dann auf die Leinwand geworfen. Nur die Sprach-Tonspur ist entfernt worden, alle anderen Geräusche, wie Tür-Knarren, Schritte oder Pistolenschüsse sind noch da.” Link. Atmos: Cathay has become the second multiplex operator in Singapore to install Dolby’s Atmos (after Shaw),” Digital Xtreme, the new and iconic auditorium at Cathay Cineplex Jem today.” Also, “For the first time ever in South East Asia, Cathay Cineplexes will debut a loyalty program exclusively for Dolby Atmos movie titles.” Five stamps gets you free popcorn and softdrink, while ten gets you comp ticket.. Link. Ghana: Film making is growing in Africa’s first post-colonial nation, but not all of it is playing in cinemas. “The opening of the Silverbird Cinema at Accra Mall in 2008 brought hope to filmmakers like Suberu. In the past, they would have had to rent a pick-up truck, put speakers on it and sell their films on the street. Although Silverbird shows some local productions, its programme is mainly filled with Hollywood and Bollywood films.” Link. UK: File under ‘Questionable Cinematic Role Model.’ “Oil & gas recruiter Spencer Ogden has hired a cinema room on Monday for its entire London office to see The Wolf of Wall Street, Martin Scorsese’s newly released film about a Wall Street fraudster.” Was it supposed to inspire, deter or just entertain them? Link.